Well, the National Rifle Association’s Annual Meeting in Dallas is over—and it was a tremendous success. It set a new attendance record, with nearly 90,000 people attending the three-day conference. Speakers included NRA spokesperson Dana Loesch, Diamond and Silk, Vice President Mike Pence, President Donald Trump, Sen. Ted Cruz (R-TX), Texas Gov. Greg Abbott, NRA-ILA executive director Chris Cox, and NRA executive vice president Wayne LaPierre. Besides allowing gun manufacturers, and small business owners to showcase their latest gear and equipment, it was also time to remind Second Amendment supporters of the gathering storm: the 2018 midterms. There has been a sense of complacency after the 2016 election; the 2017 gun sales prove that. The panic was over; Hillary lost so the Second Amendment was safe. Trump won. All is well, right? Wrong. Every year is one where the Second Amendment needs to be defended. Every year is an election year. This year two GOP, NRA-friendly governors, Rick Scott of Florida and Phil Scott of Vermont, signed into law anti-gun laws into law that banned bump stocks raised the age to purchase firearms to 21, and in Vermont’s case, limited the size of magazines. During a pro-gun-rights gathering in Atlanta… more than a quarter of the estimated 160 rally-goers carried weapons, as well as flags and signs saying “Don’t Tread On Me” as they listened to speakers talk about the right to bear arms. A few people wearing “Black Lives Matter” T-shirts showed up at the rally and made videos, but didn’t interact with the rally-goers. Retired Marine Lt. Col. Oliver North, a central figure in the Iran-contra affair in the 1980s, has been named president of the National Rifle Association. The NRA’s board of directors chose North to be the organization’s president Monday morning after NRA President Pete Brownell decided not to seek a second term. North will assume the presidency in coming weeks and has retired from Fox News, where he was a commentator. 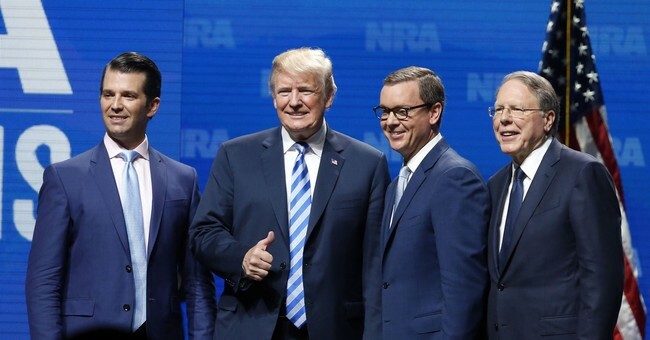 “I appreciate the board initiating a process that affords me a few weeks to set my affairs in order, and I am eager to hit the ground running as the new NRA President,” he said in a statement.